As part of the Active Transportation Master Plan, City of Brampton has designated a 40km City Loop, which was unveiled at Bike the Creek 2018. It features Etobicoke Creek Trail on the west edge; Mayfield multiuse trail on the north edge; Heart Lake Conservation Area, Esker Lake Trail, Franceschini bridge and Chinguacousy Trail on the east edge; and Kennedy Valley Trail extension, Westcreek Blvd., Dixie Rd multiuse trail on the south edge. This map from the City of Brampton indicates trails, parks and recreation areas with a listing for all facilities. 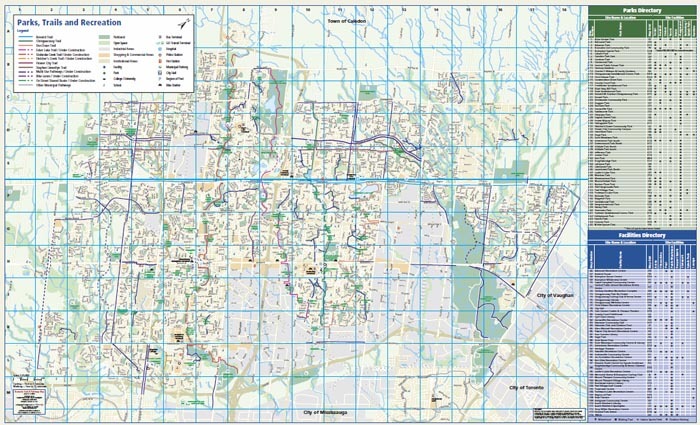 This clear map from the City of Brampton can be zoomed and appears to be very “user-friendly”. It includes roads, trails, bike shelters, parks and major city buildings. Walk and Roll Peel manages the Peel Trails Map. It can help you find trails and bike routes, has interactive features and allows searching by address, postal code or landmark. Members have uploaded millions of rides from their GPS units making this app appear to be a valuable tool for riders not familiar with a bicycle route. This onliine webapp allows riders to plan a trip, see what’s nearby, show route details, and get directions. BikeBrampton is working with the City of Brampton to improve road and trail signage. It is an on-going process and we appreciate new signs that make navigation better!